Upgrading notebooks can be easy when dealing with the right hardware, which are designed from the beginning to be VGA upgradeable. The upgrade process is rather straight forward and consists of removing the existing heat sink and thermal solution, removing the graphics card and then installing the new card while adjusting the thermal pads and re-applying thermal paste to the GPU die. After the hardware is installed users then need to download the requisite driver software and they are ready to go. Occasionally the heatsink needs to be modified or a new heatsink is needed. The simple fact is, many notebooks are just as easy to upgrade as their desktop counterparts. 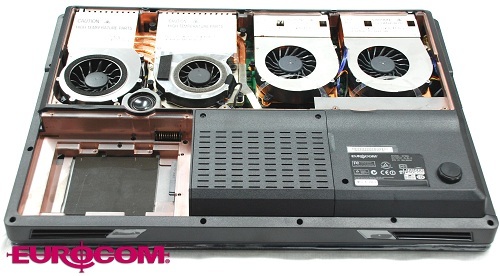 Eurocom notebooks, most notably are extremely easy to upgrade nearly any component and its flaunted in online instructional videos and any corporate communications. Eurocom uses modular MXM 3.0b VGA technology, which is an industry wide standard. Notebooks or laptops that incorporate MXM 3.0b can be easily upgraded with newer or higher performing cards of the same standard. This allows users who have purchased an upgradeable system to improve the performance and increase the lifespan of their system with an easy upgrade. Eurocom integrates MXM 3.0b technology into its high performance notebooks because it allows Eurocom notebooks to support the most powerful graphics technology on the market while allowing for continuous upgrade options. “At Eurocom, we have offered fully upgradeable notebooks to our clients for many years because we believe strongly in the long term benefits it offers; VGA upgradeability allows users to extend lifespan of their equipment while providing various levels of performance and easy migration to newer GPU technologies ” Mark Bialic, Eurocom President. Graphics VGA card technology moves at a feverish pace, it then becomes difficult for many users to keep pace. New graphics technology offers much more than enhanced gaming performance. It can vastly improve a systems ability to display and edit 2D/3D videos and photos as well as digital content creation, 3D animation, CAD/CAM and video production. A video card upgrade makes sense for almost any computer user looking for a boost in performance for gaming and/or professional applications. Video card upgrades are the second most common upgrade for a desktop computer, next to memory upgrades. Many users are unaware that some notebooks are VGA upgradeable and purchase non-upgradeable notebook or laptop and shortly after they discover that their "new" computer is already outdated technology and performance wise and they need replacement system. The problem is, this is extremely expensive and wasteful when a simple VGA upgrade in VGA Upgradeable notebook could provide the required performance boost at a fraction of the cost. Eurocom offers a wide choice of VGA upgrades for its current and past generation line of upgradeable notebooks and Laptops. There are 2 performance levels available, supported in single and Dual (SLI or CrossFireX) configuration. Here are some of our new upgradeable models supporting the list Ultra Performance and High Performance Graphics listed above.